Or view larger version. 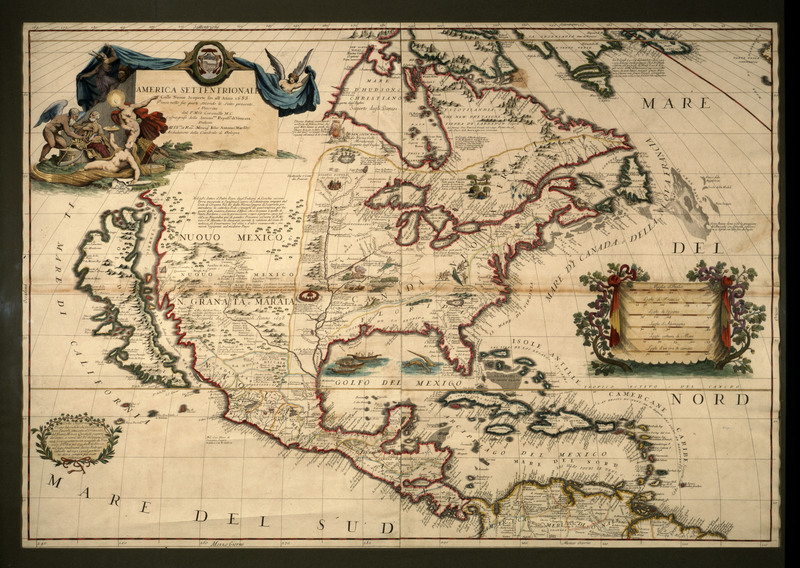 America Setentrionale – Map of the North America. 1688. P. Mro Coronelli Venice. Map. Collection of Oakland Museum of California. This map shows California as an island, a long held interpretation based on misinformation about the Gulf of California. The Gulf begins at the southern tip of Baja California and extends 700 miles to the point where the waters of the Colorado River flow into it. The Gulf was long thought to be a strait that separated the mainland of Mexico from the island of California. Francisco Ulloa proved this to be untrue. In 1539, Ulloa sailed from Acapulco up the west coast to the head of the Gulf, discovering Baja California was in fact a peninsula, not an island. However, Spain choose not to share this information with other nations.